The sacred cowrie shell, found in the islands of the Indian Ocean, was treated with special importance throughout Africa with many uses and meanings. Their shiny, semi-translucent appearance was responsible for deriving the word porcelain, coming from the Italian word for the shells, porcellana. 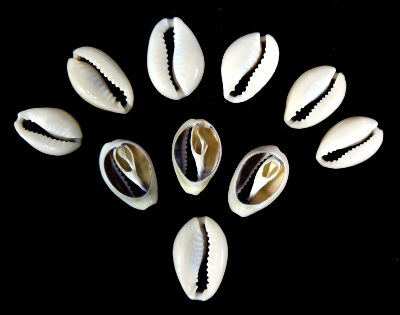 Cowrie shells were used as a form of currency in Africa. They were also used in ancient China, where excavations have found brass and silver carvings of cowrie shells, holding the symbolism for prosperity and monetary value. The shells also represented a divine power, particularly from the mother Goddess, or spirit of the ocean. They were often used to create jewelry or as decorations for many things bringing the protection of divine earthly power. 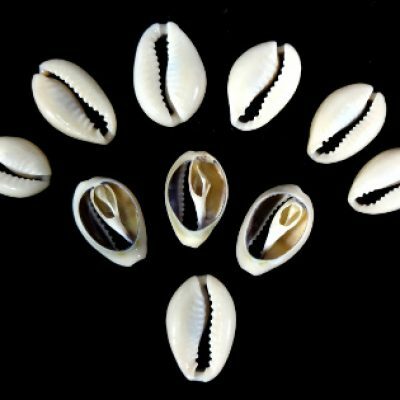 In Voodoo, cowrie shells were also used in divination, reading the patterns of the shells brings divining wisdoms to the priests who cast them. Often 16 shells are used, though this varies, for instance 21 shells are used when working with Elegua.